Lookup parts quickly by a click of a button. 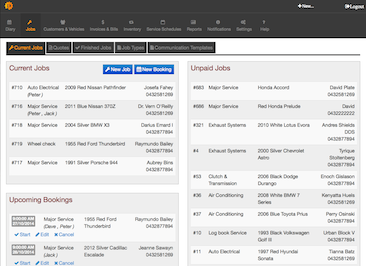 All vehicle information from MechanicDesk will be transfered to Burson EzyParts to help select the right parts, no double data entry! Lookup logbook services including labour and parts, all data will be seamlessly transferred from Burson EzyParts back to MechanicDesk. Burson EzyParts is Burson's Online parts ordering solution available for trade account customers so you can order parts without picking up the phone, saving you time, effort and money in your workshop. 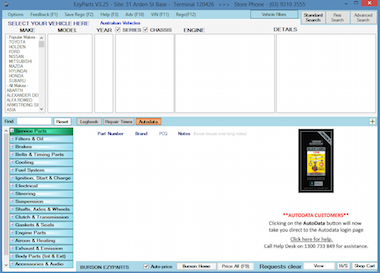 EzyParts gives you access to Burson's huge inventory and vehicle catalogue system all at your fingertips. You can search by a specific vehicle or by a part type, bring up an image and dimension information to confirm it's what you're after, with your pricing on the spot. Follow the step by step process to connect to EzyParts - and you're on your way!